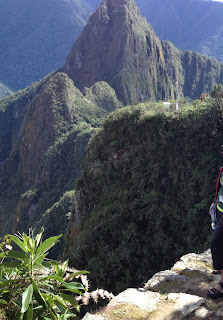 Machu Picchu was on my sister's bucket list; trekking the Inca Trail was on mine. So when my sister suggested that we should go to Machu Picchu this year, I jumped at the opportunity. 1) By combination train and bus, the mode of transport used by many visitors. 2) the Inca Trail that is a 32-mile, four-day hike, and not for the faint of heart. Having made so many other travel plans this year, I did not have much time to prepare, so I missed out booking the Inca Trail. I went with option #1, by train and bus with an adventure tour group. I was ready to set off in the hope of earning my bragging right of having trekked the Inca Trail when my sister suddenly suffered from altitude sickness. I coaxed my sister into taking the bus with me to the Machu Picchu site anyways. The bus ride to Machu Picchu was in itself exhilarating. The 5-mile ride took more than 30 minutes of hairpin turn after hairpin turn. There was no railing on the side of the very narrow road. I could see the river down below, the naked granite rocks in between, the mighty green mountains and the cloud forest above. When we arrived at the Machu Picchu park entrance, my sister’s altitude sickness worsened. She had to seek medical attention. She told me to go ahead and join the group and enter the park (the Machu Picchu site/ruins). As we entered the park, the most incredible view greeted us. As I was ready to take pictures, I realized that my iPhone (my only camera) crashed. So I went back to borrow my sister’s iPhone and a camera-camera. I found that the battery on my sister's camera was dead, and her phone camera was not set up to take pictures when it was locked. My sister did not give me her passcode. I had no camera to take photos of the insanely beautiful view surrounding me. I was so jealous of people snapping away, especially those two women from New York with telephoto lenses as if they were photographers for National Geographic. There must be a good reason for this camera debacle, I thought. I'll just capture and store everything in the memory card of my brain. I followed and listened to our guide, Freddy, who walked and talked us through temples, houses and terraces and stones. Feeling upset about not being able to take photos and worried about my sister’s health condition, I left the group and went to check on my sister. She was feeling much better, so we went back to the park and soaked in the incredible views. We were able to take pictures with my sister’s iPhone. Later in the afternoon, the rain started to fall. We took the bus down with the rest of the group. I thought about the missed opportunity of not trekking the Inca Trail and the trouble we had to endure to see Machu Picchu (90% of the people in our group suffered from altitude sickness in one form or another) all night. My friend’s nagging words about ‘the feeling that it was all worth it after hiking the Inca Trail’ kept coming back to me. The following morning, I saw a couple getting ready to set-off for Machu Picchu. When our guide asked if someone else wanted to go back, I quickly volunteered. I yearned to feel that spiritual experience I got from walking the Camino de Santiago. I needed to walk the Inca Trail from Aguas Calientes to Machu Picchu, a very steep climb. Making the quick decision to go back was one of the smartest decisions I ever made, and paying the extra S/128.00 (soles) was one of the best investments I made. We were blessed with a beautiful weather and a wonderful guide, Roberto. It was like having a private guide. He knew how to access the best vantage point for taking pictures. (I found out that my phone camera was working even though the screen was blacked out. I just had to imagine that I was shooting the right object). Roberto had perfected the art of taking pictures with my ‘blind’ camera that my pictures came out really sharp. Not only a great photographer, he was a great historian as well. He used his chimaera (spelling) pendant and four quadrants to explain the Inca culture, philosophy and religion and tied his story to the significance of the temples or altar windows we were seeing. For example, the Inca realm was represented by the condor (upper world), puma (outer earth) and snake (lower world) and their philosophy of 1) not be lazy, 2) not be a thief, 3) not be greedy. Climbing to the highest point within the Machu Picchu Park gave me the most astonishing views. Peering down below, the group of tourists at the ruins seemed like ants. The scale of what the Incas created, this mystical place at a height that cuts through the clouds, boggled my mind. Roberto concluded with, "Many studies have been done about this magical city in the sky, but the whole place remains a mystery. After walking to the Inca Bridge and savoring the fresh air, we went back to a vantage point where we had been before. Although it was the most incredible vantage point to capture the scale of Machu Picchu in photo, I found it odd that John handed me his iPhone to take their picture just then. We have been in the park all day, why didn’t he use his IPhone to take pictures, I thought. As I was getting ready to take their picture, John kneeled down, pulled something from his pocket and proposed to White. I found myself crying with happiness for the couple I just met 5 days earlier. I realized then that that was J’s reason for wanting to go back to Machu Picchu that day, making my reason of being able to claim my bragging rights of having hiked a portion of the Inca Trail insignificant.